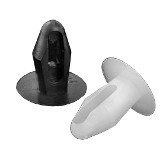 These small fasteners provide a way to mount a sign securely to a variety of surfaces. Mount a sign to a shelf, counter, display, or other surface. Assemble a 3D display unit. Add a CD or DVD to printed material. These small connectors make a variety of small jobs simple. 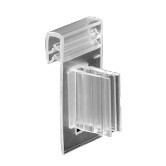 The finned edge clip provides a grip for holding signs at a right angle to metal shelving. Also know as a kudaclip, this part is capable of gripping shelving up to 13 guage, and signs up to 0.080 thick. The finned price rail flag snaps into standard 1-1/4” shelf edge channels and grips your sign at a right angle to the channel. 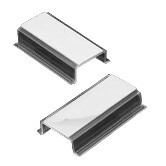 Also know as a kudaclip, this part holds sign material up to 0.080 thick. The clip slides back and forth in the shelf edge channel, allowing for quick sign positioning. The finned price rail sign holder snaps into standard 1-1/4” shelf edge channels and grips your sign parallel to the channel. Also know as a kudaclip, this part holds sign material up to 0.080 thick. The clip slides back and forth in the shelf edge channel, allowing for quick sign positioning. Available in 1/2" and 1" lengths. 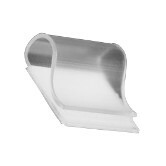 Finned j-channels mount to shelves, signs, or any smooth vertical surface with permanent foam tape. They grip signs parallel to the surface they are mounted on. 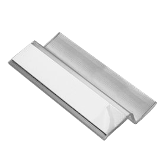 This part, also know as a kudaclip, holds sign material up to 0.080 thick. Finned saddle clips allow signs to be clipped to thicker materials, including other signs. The sign is held parallel to the material it is clipped to. The large bottom of the "saddle" holds material up to 0.187", the smaller top holds material up to 0.080". The gripping fins inside both the top and bottom saddles hold sign material securely. Wire basket clips hang over basket frames and grip small signs, holding them parallel to the basket surface. This part, also know as a kudaclip, holds signs up to 0.080 thick. Available in 0.5", 1", 1.5", and 2.5" wide versions to fit a variety of signs. The shelf channel sign holder snaps into the 1-1/4” front channel of standard retail shelves and holds small signs in place. Signs can be mounted either parallel to the shelf or at a right angle. No adhesives are required, so this little sign holder is reusable and ideal for frequently changing promotions. 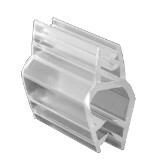 The shelf channel mount snaps into the 1-1/4” front channel of standard retail shelves. Small signs are then mounted with peel and stick permanent foam tape. The mount slides back and forth in the price channel allowing for quick sign positioning. 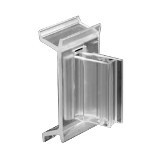 Ad pad clips snap into 1-1/4” price rails. They have a shaft at a right angle to the price rail from which take-one pads or signs can be hung. The printed material requires a 1/4 hole to fit over the ad pad clip’s shaft. The flexible, arrow-head shaped end of the shaft holds the printed material in place. 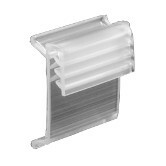 R clips allow you to clip signs to wire racks, foam core, or card stock displays. The curved clip grips a rack or display stock, and peel-and-stick foam tape on the clip’s base holds your sign in place. Slat wall clips hold lightweight signs to slat walls. Peel-and-stick foam tape attaches the sign to the clip. Positioning the sign is as easy as sliding it back and forth in the slat. 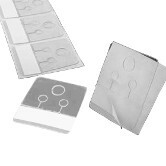 Hang tabs create a suspension point for light-weight products, take-one pads, or small signs. A base with a peel and stick liner is topped by a standard, triangular-topped hanging point. This part is ideal for fast, inexpensive hangers. 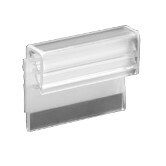 Take one coupon clips, also known as versa-clips, tab into 1-1/4” price rails and include peel-and-stick tape strips on both sides. Take one pads or signs adhere to the clip. This is a fast and cost-effective way to display your material in standard price rails. 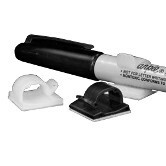 Pen clips hold pens and markers with diameters up to 3/8“ to smooth surfaces using peel-and-stick foam tape. The flexible front piece makes it easy to insert and remove the pen. Shelf push-pins fasten printed materials and merchandising items onto perforated metal store shelves. 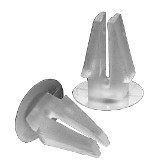 The tapered pins pass easily through your materials and insert into shelf holes. They then spread open, gripping the shelf and holding your materials in place. Dart clips insert into 1/4” holes in signs displays, pegboard, and store shelving. The clips grip securely but are easily removed. Use canoe clips for greater security or more permanent installations. 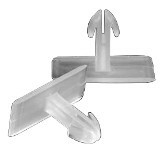 Canoe clips are fasteners that insert into 1/4” holes for secure attachment of long-term signs and displays. 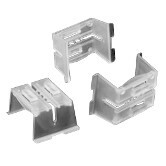 The clips can be removed and reused occasionally, but their extra-secure grip is best suited for displays that are not often changed. Xmas tree clips are inserted though 1/4” holes and bind together materials up to 0.600” thick. 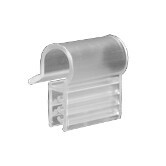 The clips also bind printed materials to 1/4” holes in store shelving or displays. Available in three lengths to fit your project. 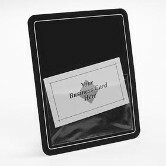 Business card pockets are adhesive-backed clear PVC pockets which adhere to your printed pieces. They hold a single standard-sized business card. 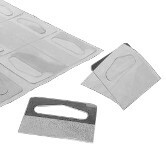 CD/DVD pockets are adhesive-backed clear PVC pockets which adhere to your printed pieces. 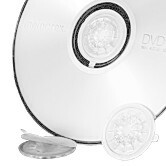 They hold a single CD or DVD disc. 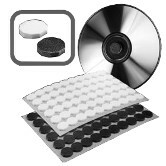 CD/DVD spindle hubs are adhesive-backed centers for mounting CD and DVD discs. Peel and stick adhesive on the hub’s back makes assemble fast and easy. When compressed, the spokes of the hub compress to accept the disc. When released, the spokes expand slightly to hold the disc in place. CD/DVD solid hubs are adhesive-backed solid rubber hubs. 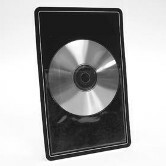 They adhere to printed material forming a spindle for CD and DVD discs. The hubs are not compressible which provides an extra measure of protection for the disc. The adhesive-backed hubs are quickly assembled and they fit all CD and DVD center holes. Dense polygon hubs are adhesive-backed and adhere to printed material forming a spindle for CD and DVD discs. 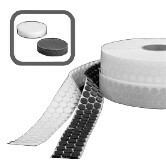 Easy to remove from the backing liner and apply to your material. They fit all CD and DVD center holes. 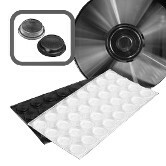 CD/DVD foam dots feature a mylar top cap which greatly improves the dots ability to hold discs in place. Easily removed from the backing liner, the adhesive-backed dots quickly adhere to printed material and fit all CD and DVD center holes.